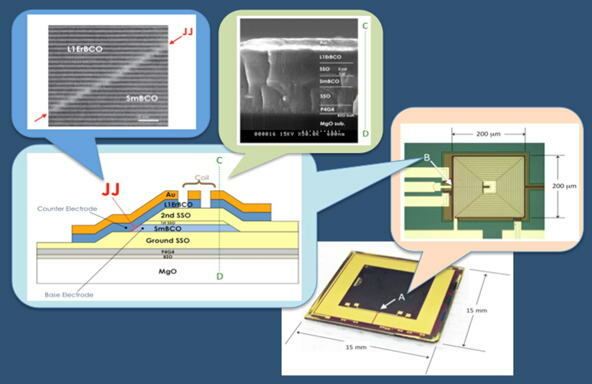 SUSTERA has a facility for fabrication of superconducting quantum interference device (SQUID) magnetic sensors with a thin-film multilayer structure including multiple oxide high-temperature superconducting (HTS) thin films and ramp-edge-type Josephson junctions.1) Employment of multilayer structure enables crossover wiring and thus flexible design of HTS-SQUID sensors. For example, highly-sensitive magnetometers with an integrated multi-turn input coil, 2) high-yield magnetometers with selectable SQUID loops, 3) and small gradiometer arrays have been developed using this technology. Another advantage of the sensors is rather high tolerance to disturbance of external magnetic field. 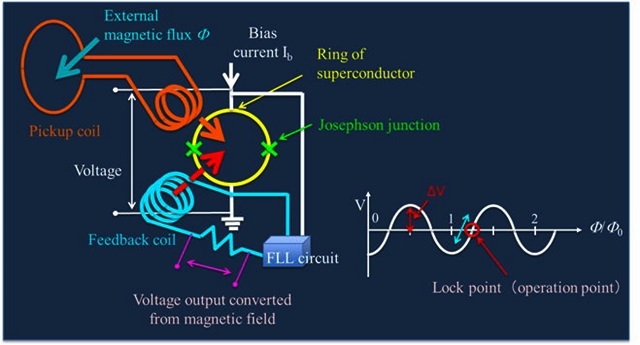 Even higher tolerance to application of external magnetic field is achieved in a SQUID sensor module for use with an external pickup coil 4) which can be mounted in a compact magnetic shield. A. Tsukamoto et al., IEEE Trans. Appl. Supercond. 23, 1600304 (2013). A. Tsukamoto et al., Appl. Phys. Express 5, 063101 (2012). 4) A. Tsukamoto et al., Supercond. Sci. Technol. 26, 015013 (2013). Configuration of magnetic sensor based on dc SQUID and operation principle. Structure of HTS-SQUID magnetometer with integrated multi-turn input coil. 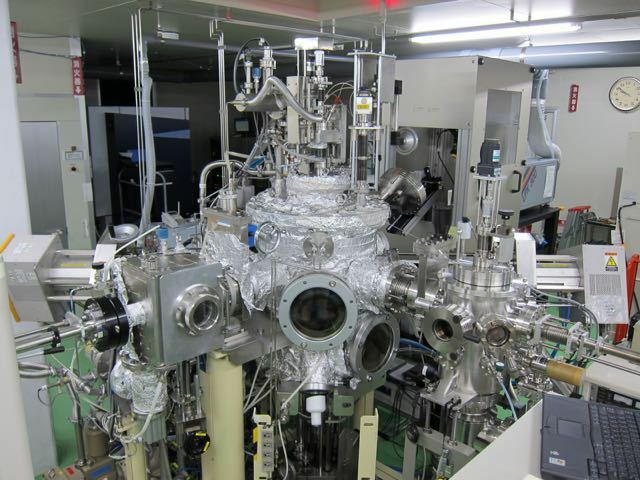 Off-axis magnetron sputtering system for deposition of oxide multilayer.